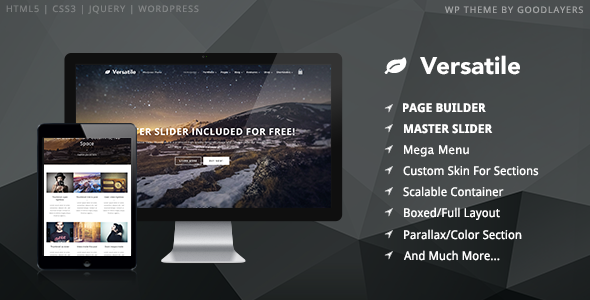 Versatile is a clean responsive multipurpose WordPress theme. The theme can be fully customized to be used in many fields such as Lawyer, Blog, School, Creative agencies, Restaurant, Church, Online shop, etc. The theme also come with Good Layers page builder which provides tons of feature. You can have section with custom skin, parallax section with custom speed.. all is done by drag & drop ability. We also provide $23 value Master Slider. This slider will blow your mind and you will forget every slider that you used before. It allows you to have, for example, video as background, slider with vertical thumbnail, slider with mobile mockup, carousel slider or even showcase slider and so much more. The slider also provide Full-screen slider, Full-width slider and Boxed slider. Item Reviewed: Versatile Responsive Multipurpose WP Theme 9 out of 10 based on 10 ratings. 9 user reviews.